I have a weak spot for Sinn Spezialuhren. Form follows function, like many German developed and designed products, in combination with a fair price is Sinn’s key to success. Except for the movement, Sinn develops a lot of high-tech solutions for real problems. What about their Diapal lubricant free anchor escapement (click here for our review), Tegiment technology process to harden the case (see our review here), Ar-Dehumidifying technology to improve readability and prevent the watch from fogging and so on. Another weak spot that I have is for this shop in Munich called Manufactum. I think they are also in other cities, but I only happen to know their Munich store. They only sell ‘good things’ over there, like the best espresso machines, the best gardening tools, the best kitchen knives, but also the best shoes, fountain pens and watches. Manufactum selects the best things amongst a lot of brands and sell them in their stores. Last year, I bought – for example – a nice meat hammer (Fleischklopfer) over there that I can use to knock on schnitzels to get the best result. 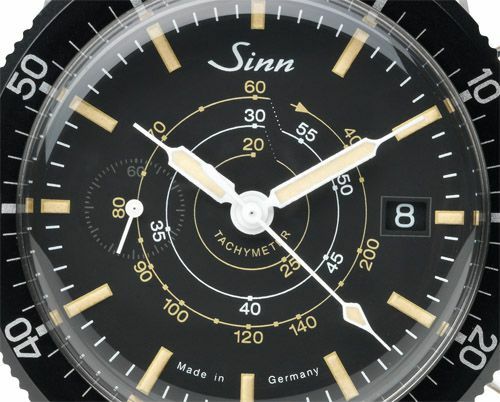 Anyway, Sinn and Manufactum decided to join forces and came up with this limited edition Chronograph Tachymeter. Limited to 100 pieces only, and only available at Manufactum. The matt black dial has a very vintage look and includes a spiral shaped tachymeter scale on its dial. 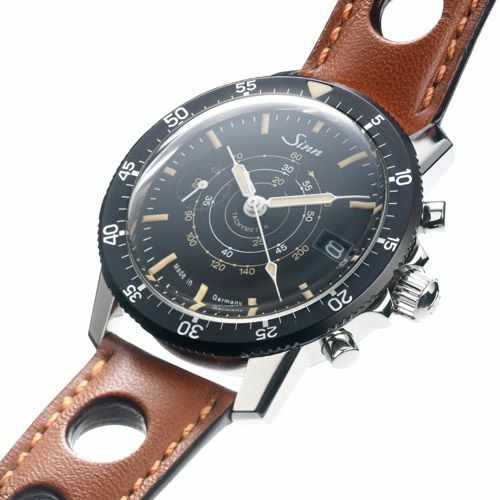 Although most tachymeter watches are able to measure speeds starting at 60 km/h, this Sinn Chronograph Tachymeter is able to measure speeds starting at 20 km/h. This Sinn Chronograph Tachymeter for Manufactum has an ETA/Valjoux 7750 movement inside, which means that it is a mechanical automatic winding chronograph movement. Proven technology so to speak, as this movement has been used for over decades in a lot of different watch models and brands. The case is made out of stainless steel and is water resistant to 200 meters (20ATM), has an acryl crystal (to keep its vintage look preserved) and a screw-down caseback and crown. This watch has a diameter of 41mm and a height of 15.5mm. 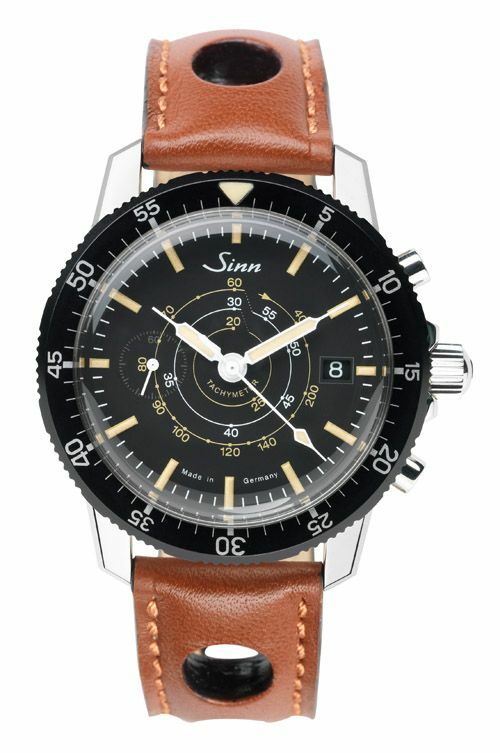 Sinn’s & Manufactum’s Chronograph Tachymeter watch comes on a nice brown leather racing strap. Price has been set to 1350 Euro. Check for availability and ordering here.